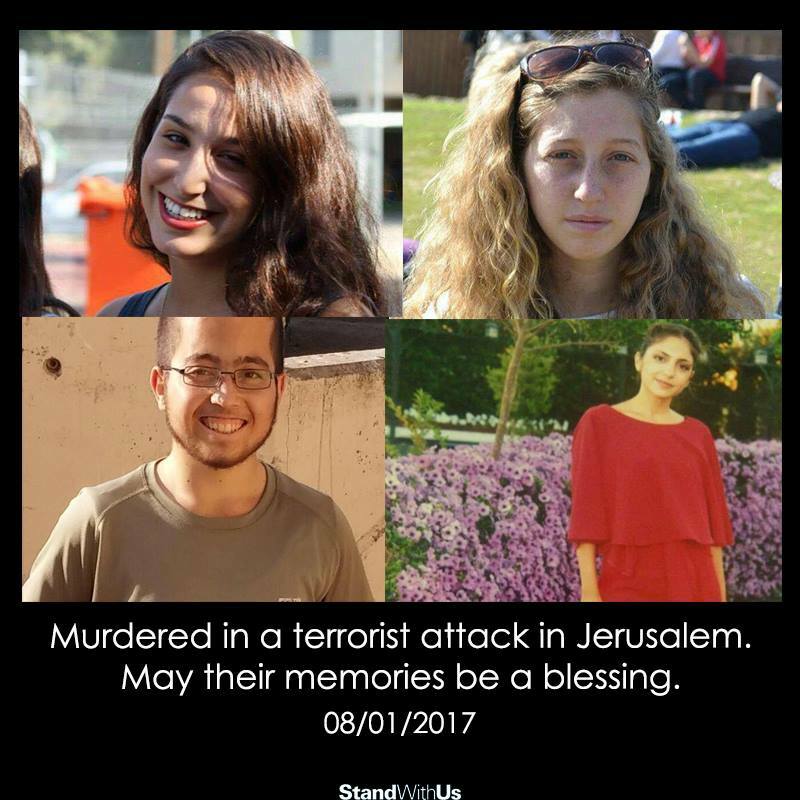 January 8, 2017 - Four IDF soldiers were murdered and 13 wounded when a Palestinian truck driver deliberately rammed into pedestrians on a popular promenade overlooking the walled Old City of Jerusalem on Sunday. They are 2nd Lt. Yael Yakutie (20) from Givatayim, whose rank was posthumously elevated to Lt.; Cadet Shir Hajaj (22) from Ma'ale Adumim, whose rank was posthumously elevated to Lt.; Cadet Shira Tzur (20) from Haifa, whose rank was posthumously elevated to 2nd Lt.; and Cadet Erez Orbach (20) from Alon Shvut, whose rank was posthumously elevated to 2nd Lt. All their families have been informed of their deaths. The truck, which has Israeli license plates stolen from a private vehicle, sped towards pedestrians waiting at a bus stop and hit them deliberately, police said. "The terrorist came from the direction of Alar Street. He noticed a group of people coming off a bus that stopped along the promenade. As far as we know, he sped up and hit them," said Jerusalem District Police spokeswoman Galit Ziv. The terrorist was shot and neutralized by several armed civilians and two soldiers who were on the scene. Palestinian sources identified the terrorist as Fadi Ahmad Al-Qunbar, a released prisoner from Jabel Mukaber, a neighborhood in east Jerusalem that borders East Talpiot. IDF troops raided the terrorist's house shortly after the attack. peaking at the scene of the attack, Police Commissioner Roni Alsheikh said there was no prior intelligence regarding the terrorist's intention to carry out his attack. He said no additional details can be revealed about the terrorist at this moment as the investigation is still ongoing. A driver who witnessed the incident said on the radio the truck ploughed into a group of soldiers, and that they fired on the driver, who reversed direction and ran over them again. "They shot him, until they neutralized him," said the bus driver, who gave his name only as Moshe. A tour guide who was at the scene said, "I saw a truck speeding... people ran for cover, yelling 'terror attack'... it lasted about a minute and a half until the terrorist was neutralized ... I was treating the wounded, trying to strengthen them and praying." Magen David Adom paramedics treated and evacuated 13 wounded to the Hadassah Medical Center in Jerusalem's Ein Karem and Mount Scopus and to the Shaare Zedek Medical Center. Among them, three in serious condition, one in moderate-to-serious condition and nine were lightly hurt. Three of the wounded had to be extracted from under the track using a crane. Eitan Rond, the tour guide of the group that was hit by the truck, claimed the soldiers at the scene were not quick to open fire at the terrorist because of the conviction of Sgt. Elor Azaria, who shot dead a neutralized terrorist in Hebron. "I have no doubt this was part of the reason," he said. "Over the last two and a half weeks, soldiers were told in the army to be careful. It pains me to say this but some of the more serious injuries here were caused when the truck drove in reverse. A few seconds less of dawdling and perhaps the situation would've been better." Rond recounted the attack, "In a fraction of a second I saw a truck speeding towards us. It sent me flying back. After rolling on the grass a few times, for a minute there I thought it was an accident. And then I saw the truck driving in reverse. I saw that I still had my gun. I ran to stand in front of the truck and started emptying my magazine at the terrorists. He drove in reverse, running over the wounded." Rond said there were soldiers at the scene that opened fire at the terrorist. The Security Cabinet was set to convene on Sunday afternoon for an emergency meeting following the attack. Hamas praised the attack, trying to get #TruckIntifada trending on Twitter and handing out sweets in Gaza to celebrate it. "This truck attack shows that any attempt to put a stop to the resistance will fail," Hamas's military wing, the al-Qassam Brigades, wrote on Twitter.